Tour in Vietnam may bring the travelers through many passes. From the North to the South or to highland areas, there are different passes attached with amazing view. They become the special destinations that contribute the tour with unforgettable experiences. 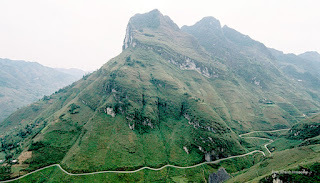 Ma Pi Leng Pas in Ha Giang is in the same case Ma Pi Leng Pass is in the 2000m high compared with the sea level. The pass can make the tour to Ha Giang to be more excited with the gorgeous moments to all people who have view here. Ma Pi Leng Pass is 20 km long. It connects Dong Van Town and Meo Vac Town. These towns are also the famous destinations in Ha Giang province. The pass is like a soft silk lying on the slopes. And there is the river named Nho Que River flowing at the base of the mountains. Ma Pi Leng Pass has a spectacular view thanks to these mountains and river are the amazing factors combined. The pass is also called The Happy Road and it is considered one of the most dangerous passes to conquer in Vietnam. There are 9 twists on the pass that you have to overcome in the time of conquering this pass. On the road there is a rock ledge protruding from the pass. It is a great place where backpackers love to take the photographs here because from this position, they can take over the view of the mountains and the river flowing on the base of the mountains spectacularly. Ma Pi Leng Pass in the our in Vietnam is considered one of the road of legend. The legend is built by the amazing natural picture with the mountains, river, forest, clouds and the road established with human bravery.